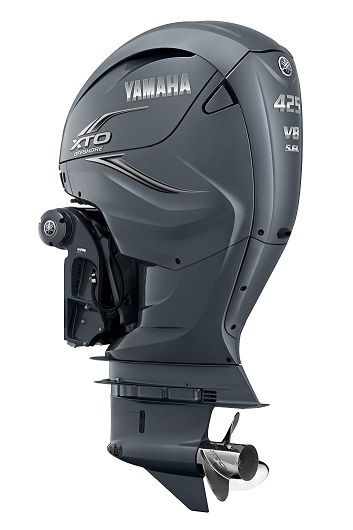 Yamaha Motor Launches F425A/FL425A Outboard Motor in North America — Highest-Output Model Meets Growing Demand for Large Outboards — - News Releases | Yamaha Motor Co., Ltd.
IWATA, May 23, 2018—Yamaha Motor Co., Ltd. (Tokyo:7272) announced today that it will launch the new F425A/FL425A* 425 horsepower outboard motor in North America in summer 2018. The highest-output model in the lineup, the F/FL425A is powered by a newly-developed 4-stroke 5,559cm3 V8 engine which delivers a maximum of 425 horsepower. This power unit features the first application in a 4-stroke outboard motor of direct injection technology, which sprays fuel at high pressure and high precision directly into each combustion chamber, rather than the intake track. This technology increases combustion efficiency, delivering unrivaled power and torque and providing boats with the ultimate in acceleration and top-speed performance. 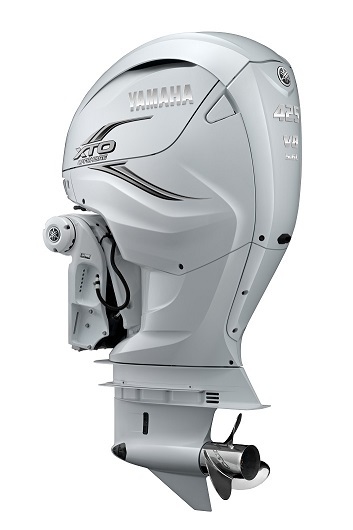 As well as strengthened parts for heavy-load operation, including the gearcase, bracket, and camshaft, the first application to a Yamaha outboard motor of technology and materials such as sleeveless cylinders formed through plasma fusion technology and iridium spark plugs delivers reliability and durability. In addition, while continuing the tradition of expressing the unique style of Yamaha in a classic outboard motor outline, the fresh new exterior design introduces a distinctive and dynamic form befitting a next-generation outboard, enhancing the appearance of the boat it is mounted on. After the initial launch in North America, the F/FL425A is planned to be progressively released in major markets such as Europe, Australia, and Japan. * The FL425A is the counter-rotation (anticlockwise) propeller specification model. North America is the key market for outboard motors worldwide, and sales of large outboard motors there continue to be healthy. A reason given for this is the focus on outboard motors in recent years as propulsion for large boats of 30 feet and over, instead of the previous mainstream of inboard and stern drive motors. Outboard motors offer the advantages in terms of speed performance, fuel economy, easier maintenance, and liberating boat interior space. Building on this market trend, the F/FL425A was developed as propulsion for large offshore boats which provide safe and enjoyable fishing and cruising by quickly reaching waters further offshore. As well as delivering the reliability and durability for which Yamaha has a well-established reputation, the F/FL425A features a wide range of new technology. For example, the combination of the ingenious new exhaust-gas relief system and specially-developed propellers provide excellent torque not only in regular travel, but also in reverse thrust. In addition, a key theme for the Yamaha Motor marine business in recent years is “becoming an integrated system supplier.” As a concrete expression of this initiative, Yamaha has developed the new Integrated Electric Steering System for the F/FL425A, eliminating the need for cables or hydraulic lines.Apart from the first introduction of electric steering, which provides quicker response to steering inputs, this system also features the Helm Master® joystick control interface and CL7 7-inch color touchscreen, together providing high operational convenience.